The report acts as a benchmark discussion document outlining the challenges and opportunities for developing sustainability banking practices in Africa. 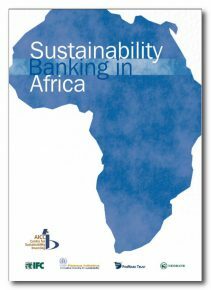 Through the support of five case studies in South Africa, Botswana, Kenya, Nigeria and Senegal, it is hoped that this report will encourage active debate regarding the principles and practices of sustainability banking in Africa, and will pave the way to uncovering unique strategies to advance the sustainability agenda within the continent. This publication was supported by the UNEP FI African Task Force, International Finance Corporation (IFC), Finmark Trust, Nedbank and Deutsche Bank.